The NewcastleGateshead And England bid to host FIFA World Cup football in 2018 received another high profile supporter as music superstar, Sting, backed the bid to see the biggest football tournament in the world come to St James' Park and the North East. Back in the region to perform with Northern Sinfonia at The Sage Gateshead as part of his acclaimed Symphonicity world tour, Wallsend-born Sting took time out of rehearsals to meet NewcastleGateshead World Cup Bid Director Mark Jackson and publically show his support to see World Cup football in England in 2018. Sting said: "St James Park would make a fantastic World Cup venue and Newcastle Gateshead a world-class host City. "The pride and passion of the people of the North-East, alongside their love of football and Newcastle United, would ensure that the competition is a true celebration of the sport and would bring local, national and international communities and cultures together." Mark Jackson, NewcastleGateshead World Cup Bid Director said: "Sting is a huge ambassador for our region and having someone who is known around the world showing his support for the England 2018 bid is a great honour." "We are getting closer to decision day on Thursday 2 December and it's still important that people back the bid and show their support for NewcastleGateshead, the North East and England." 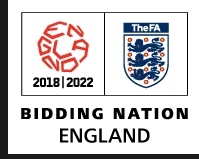 www.facebook.com/england2018 or by following the bid on Twitter www.twitter.com/england2018bid.